Nasal irrigation involves flushing the nasal passage with a saline solution. By washing away excess mucus, as well as allergens, nasal irrigation can reduce inflammation and relieve congestion, runny nose and post-nasal drip. 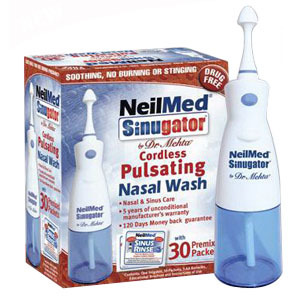 NeilMed Sinugator® Pulsating Nasal Wash is an easy to use system that allows you to deliver the saline solution with positive and pulsatile pressure to clean the nasal passages thoroughly, while maintaining your head in an upright position. You have complete control, ensuring a gentle, soothing and therapeutic experience. Soothing no burning or stinging. Use for post nasal drip, nasal dryness from occupational and house dust, fumes, animal dander, grass, pollen and smoke. Premixed packets of USP grade sodium chloride and sodium bicarbonate (purity level 99% or higher). Preservative, drug, iodine, BPA, gluten and latex free. Contents: 1 irrigator, 30 packets, 3 AA batteries, educational brochure and instructions for use.